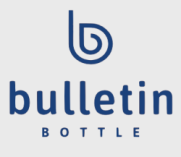 Bulletin Bottle [.com] has a small selection of recycled water bottles available for purchase. Our Translucent Sport Bottle with Push Pull Spout and Translucent Sport Bottle with Flip Up Lid are also available with post-consumer recycled PETE on special orders of 2500 bottles or more. Why don’t we offer more bottles made from recycled content? The answer is that it’s hard to guarantee the safety of the bottle material when using recycled plastics and metals. Consider metal bottles. The factory that manufactures many of our stainless steel bottles and our growlers doesn’t use postconsumer stainless steel because of potential safety hazards. They can’t guarantee where the recycled metal comes from. What if the metal came from bottles that used to hold anti-freeze, motor oil or some kind of medical waste? Yuck. We are always on the lookout for recycled water bottles to offer clients, but Bulletin Bottle [.com] won’t sell any recycled water bottle unless we are confident that the products, and the materials used in them, are safe.